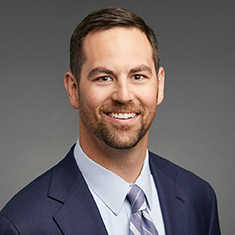 Patrick Filice focuses his practice on commercial real estate transactions, including acquisitions, dispositions, development, venture formation, finance and leasing. He advises private equity firms, real estate investment trusts (REITS), high-net-worth individuals, operators, developers, financial institutions and insurance companies on all aspects of real estate. Patrick has worked on a broad range of real estate assets, including industrial warehouse and distribution centers, office buildings, retail shopping centers, hotels, airports, vacant land, mixed-use facilities and multifamily properties. He advises investors and operators in connection with the formation of real estate joint ventures. He represents lenders and borrowers in all types of real estate finance transactions, including first mortgage loans, construction loans, mezzanine loans and other structured financings. During law school, Patrick served as a judicial extern to the Honorable Samuel Der-Yeghiayan of the US District Court for the Northern District of Illinois and as a teaching assistant for Legal Writing I and II. He was also awarded the Michael Shabat Appellate Advocacy Fellowship. Upon graduation, Patrick completed a Public Interest Law Initiative (PILI) Fellowship with the Loyola Business Law Center Clinic. Prior to attending law school, Patrick worked as a construction supervisor for Habitat for Humanity for five years. Shown below is a selection of Patrick’s engagements. Representation of a private real estate investment fund in the acquisition of a portfolio of three industrial warehouses totaling 540,000 square feet in the Chicago metropolitan area. Representation of a private investment firm in the acquisition of an industrial property consisting of three industrial warehouse and distribution centers in the Chicago metropolitan area and obtaining a mortgage loan to finance the acquisition. Representation of a private equity real estate fund in connection with obtaining mortgage and mezzanine loans to finance the acquisition of a portfolio of 10 industrial business parks in the Dallas metropolitan area. Representation of a private equity real estate fund in the sale of an industrial warehouse and distribution center in the Chicago metropolitan area. Representation of a private equity real estate fund in the sale of a 432,000-square-foot, three-building, industrial business park in Cincinnati, Ohio. Representation of a private equity real estate fund in the acquisition of a portfolio of seven industrial business parks in the Minneapolis/St. Paul metropolitan area and obtaining mortgage and mezzanine loans to finance the acquisition. Representation of a private equity real estate fund in the acquisition of a portfolio of 61 industrial properties in Arizona, Colorado, Delaware, Illinois, Massachusetts, Minnesota, Ohio and Oklahoma and obtaining mortgage and mezzanine loans to finance the acquisition. Representation of a high-net-worth individual in the sale of an industrial warehouse in Chicago, Illinois. Representation of a private equity real estate fund in the sale of two industrial office parks totaling 607,000 square feet in the Minneapolis/St. Paul metropolitan area. Representation of a private investment firm in connection with refinancing a portfolio of 12 properties comprised of industrial warehouse and distribution centers and industrial business parks in the Chicago metropolitan area. Representation of a private investment firm in connection with obtaining a mortgage loan for the acquisition of an industrial business park in the Chicago metropolitan area. Representation of a private investment firm in connection with obtaining a mortgage loan for the acquisition of an industrial warehouse and distribution center in the Chicago metropolitan area. Representation of a private real estate investment fund in the acquisition of a 491,000-square-foot, class A+ industrial warehouse and distribution center in Franklin Park, Illinois. Representation of a private real estate investment fund in the acquisition of a 367,000-square-foot, class A+ industrial warehouse and distribution center in Franklin Park, Illinois. Representation of a private real estate investment fund in the acquisition and development of a 107,000-square-foot industrial warehouse and distribution facility in the Chicago metropolitan area. Representation of a private real estate investment fund in the acquisition of a 140,000-square-foot industrial warehouse and distribution center in the Chicago metropolitan area. Representation of a private real estate investment fund in the acquisition of a portfolio of four industrial warehouses totaling 500,000 square feet in the Chicago metropolitan area. Representation of a nonprofit organization in connection with the acquisition of an historic apartment building in Chicago, Illinois. Representation of a real estate investment firm in the joint venture acquisition of a portfolio of nine buildings in four office complexes in the Dallas, Texas metropolitan area. Representation of a real estate investment firm in the joint venture acquisition of property in Houston, Texas, for the development of a mixed-use building. Representation of a real estate investment firm in the joint venture acquisition of property in Denver, Colorado, for the development of a luxury apartment building. Representation of a real estate investment firm in the joint venture acquisition of a branded hotel in Fairfax, Virginia. Representation of a real estate investment firm in the joint venture acquisition of a branded hotel in the Detroit, Michigan area. Representation of a real estate investment firm in the joint venture acquisition of a class A office building in Charlotte, North Carolina. Representation of a real estate investment firm in the joint venture acquisition of a property consisting of an 11-acre, two-building office complex in Phoenix, Arizona. Representation of a high-net-worth individual in the sale of an office building in Chicago, Illinois. Representation of a publicly traded REIT in the acquisition of an 11-acre retail shopping center in Houston, Texas. Representation of a publicly traded REIT in the acquisition of a retail shopping center in Phoenix, Arizona. Representation of a publicly traded REIT in the acquisition of an eight-acre retail shopping center in San Antonio, Texas. Representation of a publicly traded REIT in the sale of a 260,000-square-foot office building in the Chicago metropolitan area. Representation of a publicly traded company in the joint venture acquisition of property near Nashville, Tennessee, for the development of a luxury apartment building. Representation of a publicly traded company in the joint venture acquisition of property near Denver, Colorado, for the development of a senior living project. Representation of a private equity real estate fund in the acquisition of a 59-acre, five-building medical office property in Durham, North Carolina, and obtaining mortgage and mezzanine loans to finance the acquisition. Representation of a real estate investment firm in the joint venture acquisition of a medical flex office building in Annapolis, Maryland. Representation of a publicly traded REIT in the acquisition of a seven-acre retail shopping center in Fort Worth, Texas. Representation of a real estate investment firm in the acquisition of a 28-story, class A office building in Chicago, Illinois. Representation of a publicly traded REIT in the sale of a class A office building in Wilmington, Delaware. Representation of a life insurance company in providing mortgage financing secured by a luxury apartment building in Indianapolis, Indiana. Representation of a life insurance company in providing mortgage financing secured by a portfolio of four industrial warehouse and distribution centers in Illinois. Representation of a life insurance company in providing mortgage financing secured by a 1.6-million-square-foot retail shopping center in Overland Park, Kansas. Representation of a life insurance company in providing mortgage financing secured by a 430,000-square-foot luxury apartment building in Chicago, Illinois. Representation of a life insurance company in providing mortgage financing secured by a 15-acre retail shopping center in California. Representation of a life insurance company in providing mortgage financing secured by a 950,000-square-foot retail shopping center in Fargo, North Dakota. Representation of an international bank in providing mortgage financing secured by a portfolio of three mixed-use properties in Chicago, Illinois. Representation of an international bank in providing mortgage financing secured by a portfolio of seven mixed-use properties in Chicago, Illinois. Representation of a life insurance company in providing mortgage financing secured by a brand-managed luxury hotel in Dallas, Texas. Representation of a life insurance company in providing mortgage financing secured by a 35-story office tower in Chicago, Illinois. Representation of a life insurance company in providing mortgage financing secured by a 1.3-million-square-foot, two-level, enclosed shopping mall in Eden Prairie, Minnesota. Representation of a life insurance company in providing mortgage financing secured by a luxury apartment building in Minneapolis, Minnesota. Representation of a private equity investment firm in connection with its sale-leaseback of a branded hotel in Tampa, Florida. Representation of a private investment firm in a long-term lease as ground lessor to develop two mixed-use buildings in Boston, Massachusetts, and obtaining financing secured by the lease. Representation of a privately held insurance company in a long-term lease as ground lessor of an office tower in Louisville, Kentucky, and obtaining financing secured by the ground lease.